Statistics Lithuania informs that in January 2018, against December, prices for the total industrial production sold increased by 0.8%, refined petroleum products excluded – 0.1%. The overall price change was influenced by an increase in prices for refined petroleum products and tobacco products, as well as by a decrease in prices for electricity, gas, steam and air conditioning supply. The greatest influence on the change in prices for industrial production sold by economic activity is provided in Table 1. Over the month, prices for industrial production sold on the Lithuanian market increased by 0.2%, refined petroleum products excluded – remained almost unchanged. The largest increase in prices was observed for the production of manufacture of basic metals – 5%. The largest decrease in prices was recorded for the manufacture of beverages – 2.7%. Among food products, fruit, berries and vegetable juice went up in price by 15.9, meat and poultry products – 4.8%, while rusks and biscuits, preserved pastry goods and cakes went down in price by 2.6, milk and cheese products – 1.8%. 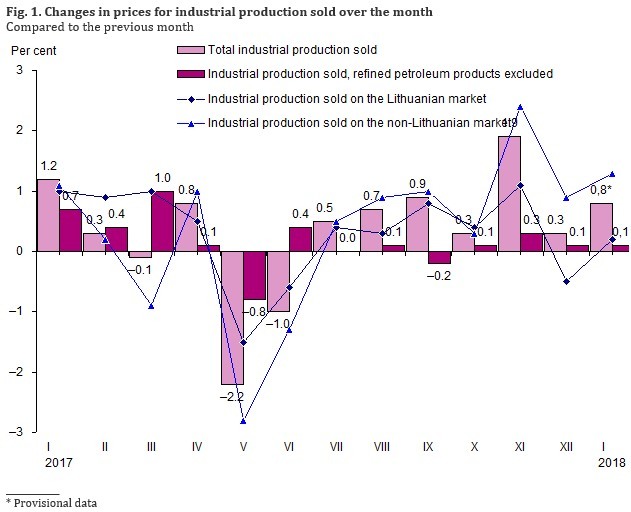 Over the month, prices for industrial production sold on the non-Lithuanian market increased by 1.3%, refined petroleum products excluded – 0.3%. Over the month, the overall price change for industrial production sold on the euro area market increased by 1.8, on the non-euro area market – 1%. The overall change in prices for industrial production sold is influenced not only by the rate of change in the price of a certain product but also by the relative share (weight) of the industrial production sold within certain economic activity in the total industrial production. Over the year (January 2018, against January 2017), prices for the total industrial production sold increased by 3.1%, refined petroleum products excluded – 1.8%. 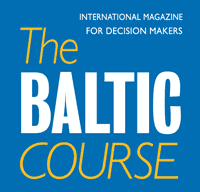 Over the year, prices for industrial production sold on the Lithuanian market increased by 3%, refined petroleum products excluded – 1.8%. 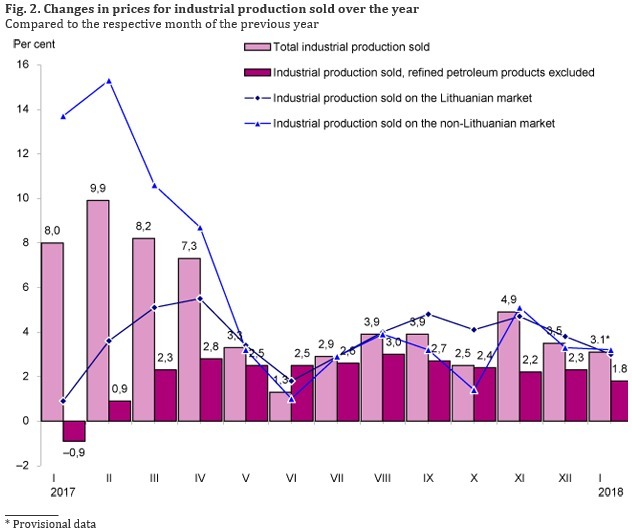 Over the year, prices for industrial production sold on the non-Lithuanian market increased by 3.2%, refined petroleum products excluded – 1.7%. Over the year, prices for industrial production sold on the euro area market increased by 2.1, on the non-euro area market – 4%. - Such a phenomenon (indicator) was not observed during the respective period. The new weighting system for the calculation of the PPI in 2018 is based on the 2016 year data on industrial production sold classified under the Classification of Products and Services (Produktų, gaminių ir paslaugų klasifikatorius, PGPK) in value terms. According to the Laspeyres formula used in calculations, the base period data need to match the weightings’ data. 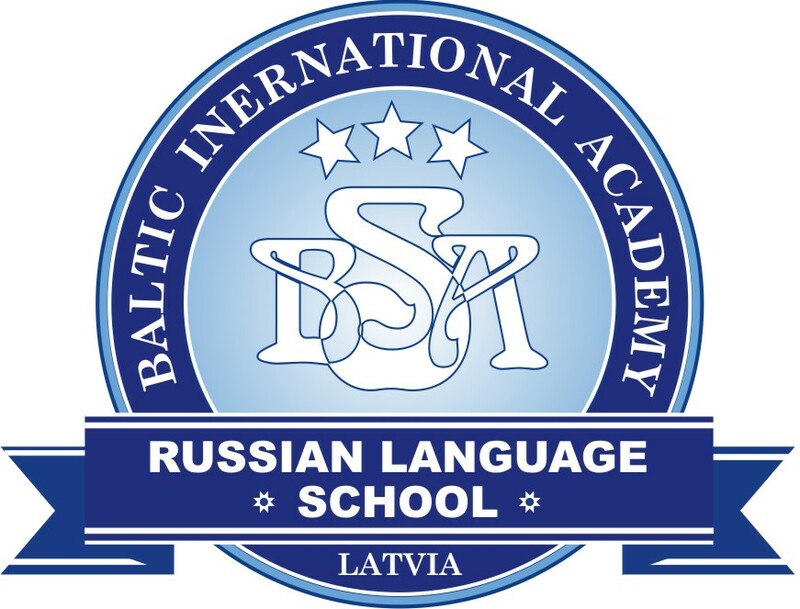 The base period is December 2017, i.e. in 2018 monthly prices are compared against the said base period. Therefore, the statistical data on the amount of production sold in 2016 were recalculated using the indices of producer prices for industrial production sold and expressed in December 2017 prices. The current weighting system comprises 545 selected PGPK codes. The share of industrial production sold under these product categories accounts for 80% of the total industrial production sold in 2016. 764 industrial enterprises participate in the statistical survey. Every month, they provide prices for 1979 representative products; out of them, 602 enterprises – on 1200 prices for products sold on the Lithuanian market and 386 enterprises – on 779 prices for products sold on the non-Lithuanian market. A press release on the February 2018 PPI is due on 9 March 2018. For more information on the issue, please see the Database of Indicators.